Siesta. In some countries, an afternoon nap is part of the culture; to escape the afternoon heat, rest, and re-energize. 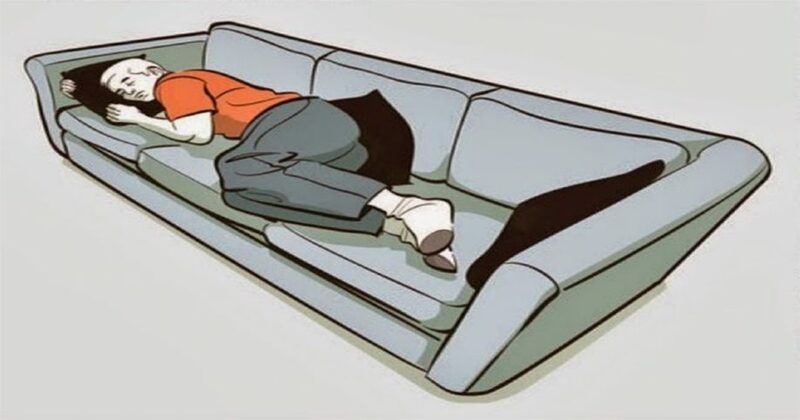 Science has found that a short nap in the middle of the day can not only provide rest but improve mood, physical performance, memory, and the ability to learn. At most places of work in North America, there is no place for a mid-day snooze and taking a nod at your desk is frowned upon. More progressive companies like Ben & Jerry’s and Google recognize that optimum performance comes from healthy, well-rested people and provide nap spaces in their offices. When a baby’s life begins, naps are frequent and absolutely necessary for growth and development. Elderly people (who often find that they don’t sleep as well or as much during the night as they used to) often catch a few Zs during the day as well. Everyone in between is expected to rise in the morning and power through until late night, excelling in a variety of roles and activities. We may, however, do better with a break like the youngest and oldest among us. 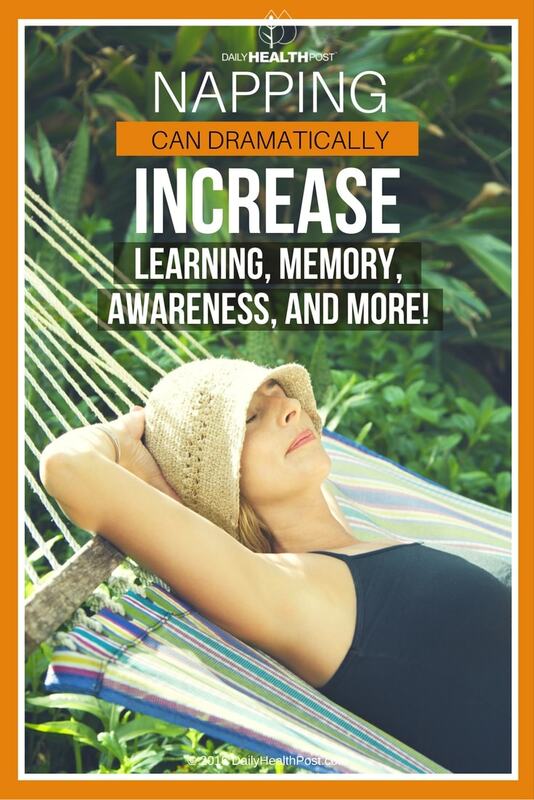 A 2009 study looked into the benefits of a mid-day nap for the purposes of learning and memory based on age, experience with napping, and timing and length of sleep. 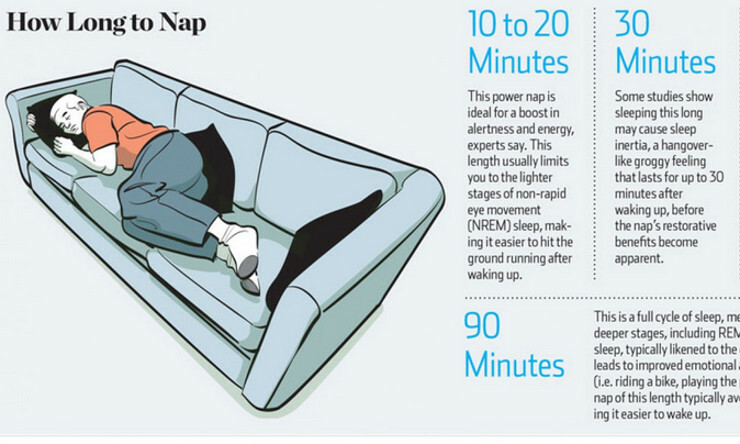 What they found is that once you get into the habit of napping, your naps become more beneficial and productive. “Sleep inertia” (the groggy time before becoming fully alert after sleeping) is also less intense and of shorter duration as your body gets used to short naps. The length of the nap is also a significant factor in reaping the benefits: a 10-minute nap is more effective than a 30- or 90-minute sleep for quick rejuvenation. Sleeping longer than 10 minutes means that waking up is more difficult due to the deeper levels of sleep, reducing the benefits of the nap (1). Nap duration makes a difference and has different effects. A mid-day nap of 90 minutes or more can reduce sleep inertia and be restorative to compensate for an inadequate night’s sleep (3). Consistent napping at the same time and for the same duration has the most positive effect. If you’re consistently tired in the afternoon, your body is trying to tell you something. Hitting the ground running once you get to school or work every day requires a great deal of energy and almost everyone starts to flag by mid-afternoon. Most of us plow through and take a cup of coffee or other caffeine to get us through the second half of the day, but you should consider giving your body what it craves. A British study comparing the effectiveness of a nap, longer sleep time at night, and drinking caffeine in the afternoon to relieve the afternoon crash found a nap the most rejuvenating (4). Napping on a regular basis (3 or more times a week) can also reduce blood pressure and stress level. A nap isn’t a good idea if it impairs night-time sleep. A long period of sleep (usually at night) is critical for overall health. Your body needs the rest while the brain goes about its housekeeping to rid the body of toxins and store memories. If you take a nap too late in the day and it prevents you from falling asleep or sleeping long enough at night, any benefits it may lend are offset. Early afternoon seems to be the best time for a quick doze. Find a quiet, dark, cool place (put on a sleep mask if it helps) and allow yourself to relax and rest during the day to stay on top of your game.